I like the way that even though there’s no word wrapping, every word makes sense – as well as RANDOMIZE you’ve got “RAN” (past participle of “run”), “DOMIZE” (another word for death), “RANDO” (Portuguese restaurant), “MIZE” (plural of mouse in Somerset), “RANDOMI” (ancient tribe from Kidderminster or somewhere) and “ZE” (last letter of the alphabet, according to Americans). So really, this game should be called RANDOMIZE RANDOMIZE RAN DOMIZE RANDOMIZE RANDOMIZE RANDO MIZE RANDOMIZE RANDOMIZE RANDOMI ZE RANDOMIZE, not RANDOMIZE RANDOMIZE RANDOMIZE RANDOMIZE RANDOMIZE RANDOMIZE RANDOMIZE RANDOMIZE RANDOMIZE RANDOMIZE. I’ll overlook this error just this once. 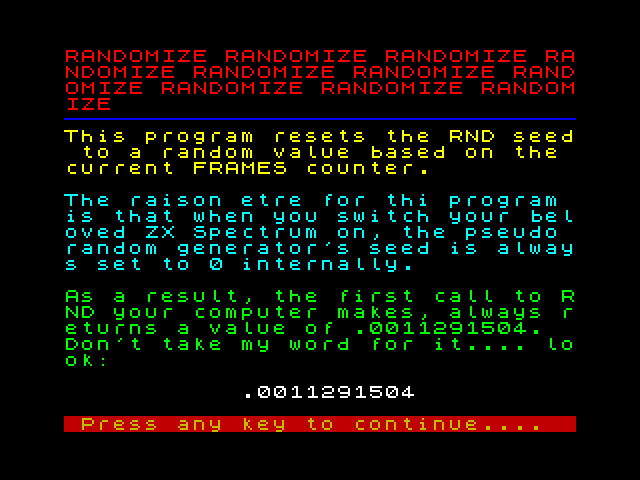 A rather colourful menu appears, which explains the premise of the game… although I’m not convinced RANDOMIZE RANDOMIZE RANDOMIZ(Yes, yes, we get it. Ed.) is a game yet. However, it does feature a “raison etre”. Oh goody, another one of those French biscuits! 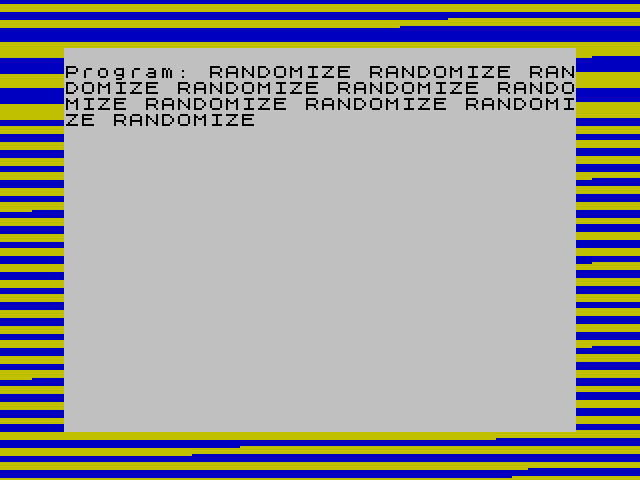 Anyway, a well known factoid amongst crap game authors is that the Speccy’s random number function – RND – is only random once RANDOMIZE is used. If you reset your machine and type LET n=RND without first RANDOMIZing, a value of .0011291504 will always be returned. It’s why Watching Paint Dry had such predictable scoring – there was no RANDOMIZE in there, so the same numbers were generated each time the game was run. By now you’re probably wondering what the point of all this is, and to be honest, so am I, which is why I’ve repeatedly padded out the review with the title – which, in case you’ve forgotten, is RANDOMIZE RANDOMIZE RAN(Oh, shut up. Ed.) I suppose if you’re a crap game author and you need some genuinely random numbers, you could do a lot worse than use this utility. On the other hand, there’s no gameplay element whatsoever. Still, to paraphrase William Shakespeare (or was it William Shatner?) “Never let gameplay get in the way of a truly crap CSSCGC entry you’ve just wasted over half an hour of your life reviewing”. 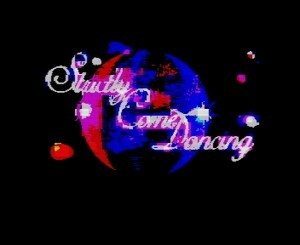 Score: an utterly predictable .0011291504%.